The Royal Canadian Mint has unveiled a new silver coin which commemorates the 125th anniversary of the invention of the sport of basketball. The coloured convex-shaped coin which is made from 99.99% pure silver has a limited run of 8,500 coins worldwide which will make it a collectors item for basketball fans across the country. More information can be found below or on the Royal Canadian Mint website. The rules are simple—the pace, exciting! 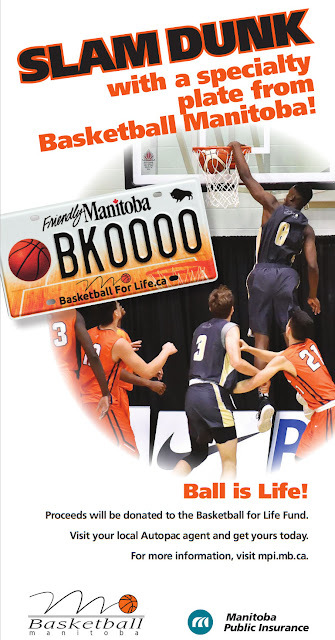 Whether playing offence or defence, every player has the opportunity to let their skills shine in a game of basketball; but this action-packed sport also relies heavily on teamwork, where smooth passes and soaring rebounds are just as important as the gravity-defying dunks and three-point plays that drive spectators wild. Invented in 1891 by a Canadian, Dr. James Naismith, in 1891, basketball has evolved over time to become one of the most popular sports played around the world. Whether you're playing indoors or outdoors, it doesn't take much to play a simple pick-up game—all you need are two players, a ball, and a shared love for the game. If you enjoy basketball, this coin was made for you! Order today! A MINT FIRST! Introducing our first-ever coloured convex-shaped coin! RECREATES THE ROUNDED APPEARANCE OF A BASKETBALL! Your coin's unusual curvature offers the perfect canvas for recreating the rounded appearance of a basketball. LOW MINTAGE! Only 8,500 coins will ever be made worldwide! Celebrate the 125th anniversary of a sport invented by a Canadian. Your coin's design includes the commemorative dates of "1891-2016" that mark basketball's 125th anniversary. OUTSTANDING ATTENTION TO DETAIL! Precision engraving replicates the tactile elements that are famously associated with the basketball—specifically the recessed lines and dimpled surface! A SLAM-DUNK GIFT IDEA! The unforgettable coin design makes this a must-have for collectors, and a slam-dunk gift idea for any basketball fan! 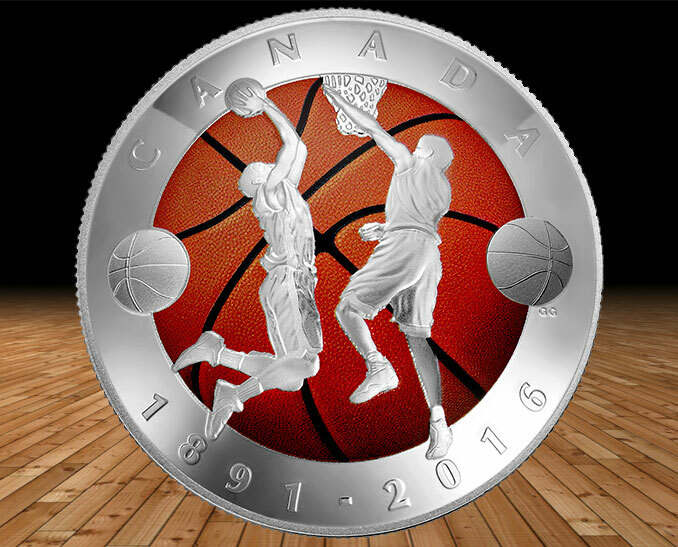 Designed by Canadian artist Glen Green, your coin uses the coin's deeply convex curvature to recreate the rounded shape of a basketball. In addition to the engineering complexity of the coin's unusual shape, precision engraving replicates the tactile elements that are famously associated with the basketball—specifically the recessed lines and dimpled surface—while the application of colour captures its iconic orange appearance. In the foreground, an engraved action shot captures the classic, fast-paced intensity of the game: the player on the left leaps towards the net as he goes for a dunk shot, while the player on the right moves quickly to defend the shot with his outstretched arm. On both sides, two engraved basketballs overlap the wide band that frames the reverse image, where the word "CANADA" is engraved above the commemorative dates "1891-2016" that mark basketball's 125th anniversary. As the one side of your coin is convex, the other side is concave. To keep athletes moving indoors during the cold winter months, James Naismith of Almonte, Ontario, invented basketball as a team-based game of skillful passing while teaching Physical Education at the International Young Men's Christian Training School in Springfield, Massachusetts. Points would be scored by throwing a soccer ball into the peach baskets mounted to the balconies on either end of the gym—although someone would need to climb up a ladder to retrieve the ball since open-ended nets were only introduced in 1913. 50 countries. Basketball's status as a sport was cemented when it became an official Olympic event during the 1936 Games in Berlin, where its inventor was on-hand to present the silver medal to the Windsor Ford V8s of Windsor, Ontario. Over 450 million people of all ages and skill level play basketball, which has become one of the world's fastest-growing sports. Far from the high scores of today's matches, the first ever basketball game ended in a 1-0 score. The first women's game was played in 1893. The dimples on a basketball were introduced to provide players with a better grip on the ball. The backboard was a necessary addition during the sport's early days—it prevented spectators from interfering in the game by reaching over to handle the ball! Dribbling was only permitted after a 1901 rule change, which allowed a single bounce but prohibited a player from shooting the ball afterwards. Continuous dribbling came in 1909 but another rule change in 1927 outlawed dribbling once again—the rule was abolished two weeks later. The ball itself has a fascinating history: while basketball was initially played with a soccer ball, the first original ball design was introduced in 1894 and was made from brown leather strips laced together—a far cry from the bouncing manufactured basketballs of today! 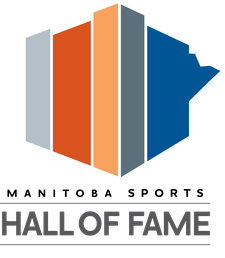 Over time, ball designs evolved with the game as the focus moved from passing to dribbling; eventually, the basketball acquired its iconic bright orange appearance that fills the colourful background on your coin's reverse, where the eye-catching curvature is itself an innovative feat of engineering.